When Lance Michelli's grandma, Antonia, has a stroke, she manages to give him a letter and send him on a mission. With little to go on, he travels to a cloister in the old country. Upon his return, he and his trusty pooch, Baxter, end up at a villa being transformed into a bed and breakfast. A perennial rescuer of damsels in distress, he nearly meets his match in the person of Rese Barrett. With her heart closed off to love and dealing with grief, she's built walls so high even she can't see over them. Lance takes the job of chef and begins restoring the carriage house where he'll stay until Rese decides if he's a keeper. As he works, the property yields clues to its past, including a shocking discovery. He struggles with his mission from Grandma Antonia and his growing relationship with Rese. Will he be successful or once again hit the road? A stand-alone novel, this book is the first of a series by Kristen Heitzmann. I was a bit surprised by the toned down fright factor and the ramped up love connection, but it worked. 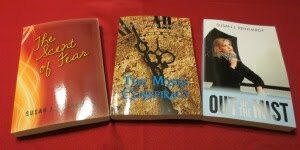 All you romance fans will love the story, and mystery buffs will smile as well. I'm looking forward to her next book, "Unforgotten." Yup, I'd say this was another winner for Kristen. Writers: How do you feel about tweaking your genre or even abandoning it completely to address changes in the marketplace? Readers: When a favorite authors take another genre road, do you stick with them or abandon ship? Why? I'm learning that I prefer stories to be heavy on the romance. Sub plots annoy me because I just want the love story. It helps to know a writer will deliver what I know of them already, but I realize readers are a mixed bunch and I'll enjoy a story which veers a little from my first preference. Especially if the writing's strong. I like to stick with authors who change it up, but I may still prefer their original genre. It just depends on the story. 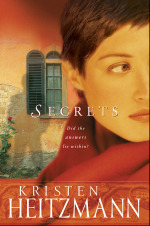 Hi Dotti - I identify Kristen more as a mystery/suspense author. I kept expecting that element to increase, but the focus returned to the romance. Perhaps she's building the tension for the subsequent books. Hi Karen - Yes, I stick with them as well. Switching gears keeps the writing fresh. I think of Kristen as a suspense author, but have no trouble getting used to the idea that she writes in other genres. I love her writing, period. I also love her writing. She keeps me fully engaged. Hi Susan...If an author's style is one I like, I think I'd be disappointed if he/she changed completely. I'd miss what I was used to enjoying. It's quite a shift when you're expecting something different. I have to say, she did a great job. Perhaps this book is a prelude for creepier things in the rest of the series.